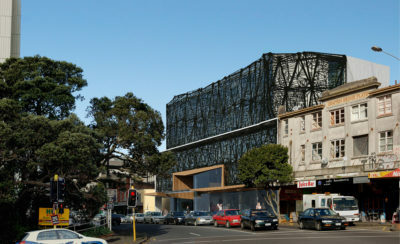 Our vision for this important site located on Auckland’s Parnell Road has the Historic Windsor Castle placed as the central focus to a proposed development of urban tenancies and luxury apartments, becoming a strong reference point from which to craft a unique yet complementary architecture.A refined black steel frame folds around the historic Windsor Castle. The glazed walls are veiled in a curtain of woven bronze screens, shimmering and ever changing in the light. 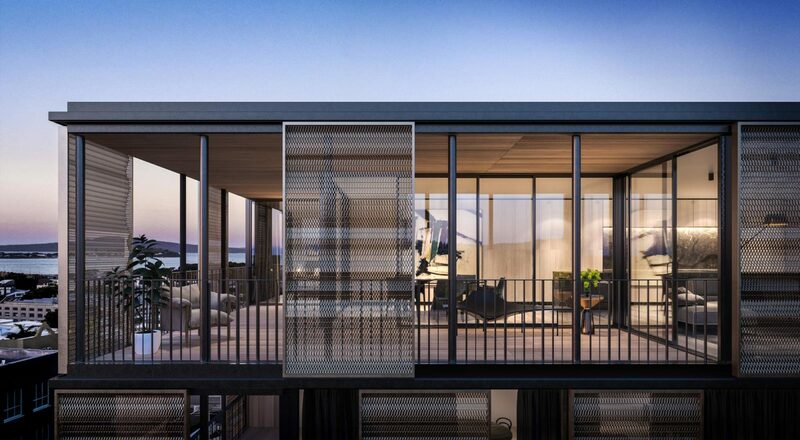 By night the building glows like a Japanese lantern evoking an atmosphere of urban luxury. The Windsor Apartments proposal consists of a new ‘L’ shaped apartment building framing the refurbished Windsor Castle, a historically significant pub first built in 1850 and extended in the 1880s. The ground floor of the proposed development accommodates retail spaces, services and parking, while the ground floor space of the existing Windsor Castle proposes a new high quality restaurant and pedestrian entry into the apartment complex above. The upper level of the Windsor houses two apartments carefully grafted into the existing heritage fabric, leaving much of the heritage building interior intact and refurbished to modern standards. 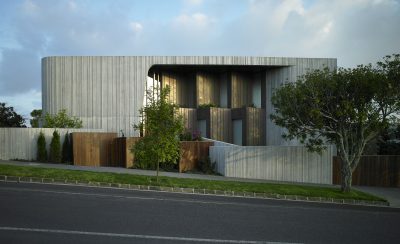 The mass of the new building is brought out to front onto Parnell Road, delivering a contemporary urban edge, that that has emerged along this road in recent years. The base of this section of the new building contains a café tenancy and canopy stretching out to continue the scale and form familiar to the existing streetscape. Above, the new apartments are each designed with generous balconies fronting onto Parnell Road. These are encased in sliding bronze mesh screens, formed into sculptural shapes that reference the cornice and pedimentdetails ornamenting the Windsor.The exterior of the new building has been designed as a counterpart to the Windsor Castle through contrasting the weight of the heritage building with a light, more open structure. With this design we have aimed to create a new landmark building for this important and prominent site which frames the iconic heritage structure as the central focus – a new building that embraces and enhances the value of the heritage structure through an engaging and elegant contemporary architectural response.